This is a holiday I have just discovered. Although if I had been paying more attention in Ruthie's Block Humanities class my senior year of high school I may have discovered it then. It was mention in The Wife of Bath's Tale from Chaucer's Canterbery Tales. What in the world is a Flitch? Apparently, it is half a pig. The celebration of Flitch day is recorded to be July 19 although some people say it is always the 3rd Saturday in July. This is the case for this year when it was celebrated on the 14th in Dunmow. What is the deal with celebrating half a pig? According to the historical documents it is not the pig that is being celebrated. The half of a pig was the prize. A married couple who had been married longer than one year and a day would come before the court and pledge their oath of devotion. If the court, consisting of 6 maidens and 6 bachelors, approved then the couple would be awarded the Flitch. Read more HERE about the Dunmow Flitch Trials. 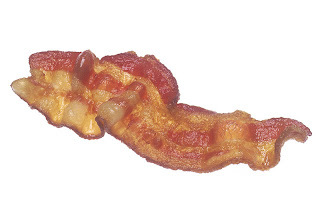 Some speculate this is the origin of the term Bringing Home the Bacon. There is some question about this, although I am fairly convinced as there is really no better references to the origination of this term. It is suggested in The Phrase Finder that the term is a truly American term first associated with boxing. You decide. Who is bringing home the bacon this year? This celebration occurs every four years. This years events are wonderfully documented in the Essex Voices Past. It includes pictures from the festivities and other interesting links to further information about this event. Being from the United States, it is also interesting to see that a couple from Nashville Tennessee successfully defended their marriage at the Dunmow Flitch Trials in 2008. I have a particular interest in this celebration as we LOVE bacon around here. I even have a niece whose nickname is the Baconator she loves bacon so much. Mark your calendar! The next Dunmow Flitch trials will be held in 2016.